The old pop-up message windows in legacy versions of Game Maker were simple to use but could only be used with the Windows Operating System. They halted the game while waiting for the player to press a button. Game Maker Studio however is a cross-platform games compiler and many devices do not allow the application to block the device pending input. 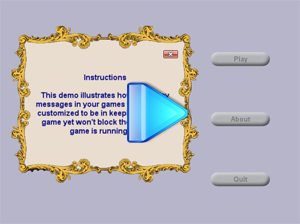 This tutorial and example will show you how you can easilly create your own custom messages. Messages do not halt game execution. Cross Platform Compatibility – Even HTML5 can use it! Message text color can be customized. Optional Windows style "Close X" button. Timed messages without a custom confirmation button. Supports up to three option buttons per message. Custom button caption text for each button. Accepting user input yet remaining cross-platform compatible can be something of a headache. Game Maker Studio has the ability to compile for several platforms / devices, many of which do not have physical keyboards. Game Maker Studio contains functions which can invoke a virtual keyboard on some devices however their look and style vary and they are imposible to customize. 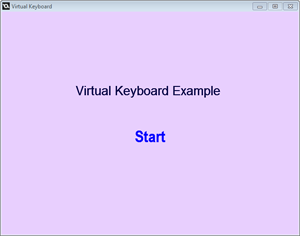 This tutorial and example will show you how you can easilly create your own virtual keyboard. Input does not halt game execution. 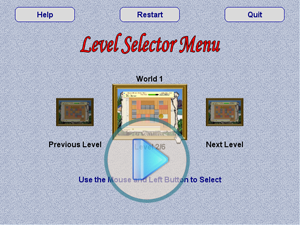 When creating a game containing several levels or locations it is sometimes desireable to allow the player to select one of them to play rather than forcing them to start from the begining or simply continue where they left off. Optional Level Locking system, preventing some levels from being selected. Mouse or Touch controlled, no keyboard required. Changeable thumbnail images to suit your own game.